In 2013 Vermeir & Heiremans started to investigate how to 'financialise' the 'house as art work', how to make it 'liquid' without having to sell the house. The result was ART HOUSE INDEX (AHI–), an experimental financial index that measures the economic and symbolic value of the 'house as art work', including the cultural capital and other symbolic values that Vermeir & Heiremans, as 'public persona', accrue. The index is itself both an art work as well as a functioning financial index. 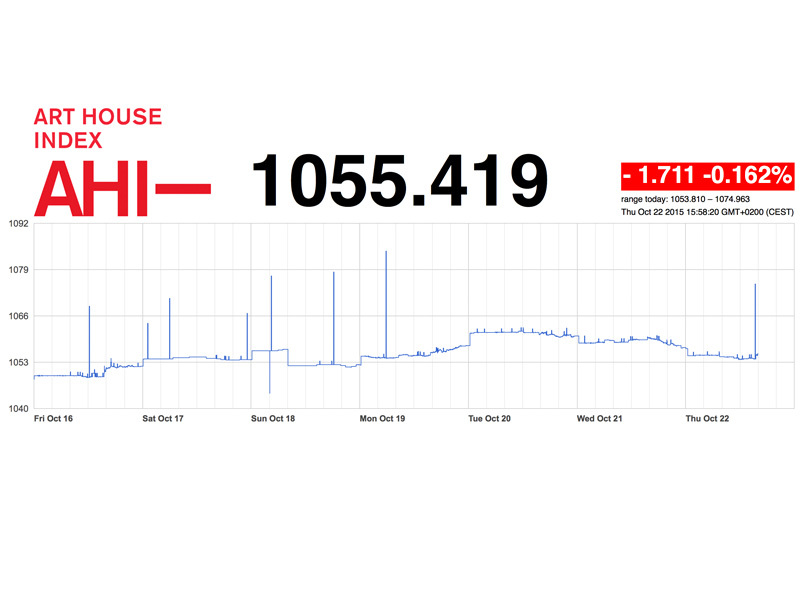 ART HOUSE INDEX gathers real-time information from different parameters that together compose the index, such as the art and real estate markets, but also data from an attention economy on their work e.g. visitors to the artists' website... Auction prices are not calculated in this index, since the work of Vermeir & Heiremans is not present in the auction market. The different data assembled are ‘weighted’ against one another for their greatest relevance in measuring the ‘value’ of the ‘house as art work’. An algorithm continuously recalculates these data, resulting in an abstract number going up or down. At this moment it is not possible to invest in the index itself, but the artists are currently researching the conditions under which financial products could be developed to trade on the index. Research on ART HOUSE INDEX was publicly presented for the first time in the form of a lecture-performance in a conference room in the Marmara Hotel on Taksim Square during the public program of the 13th Istanbul Biennial. Referencing the ceremonial launching of companies on the stock market, the performance was presented as an IPO (Initial Public Offering).